ClickFunnels is a marketing software as a service (SAAS) that simplifies the process of creating sales funnels. Many popular and successful business owners use ClickFunnels to grow their businesses. Based on the human psyche, it is a unique strategy that works by leveraging how buyers react to sellers. But, how much is ClickFunnels? After using ClickFunnels the online business owners saw a good return on their investment (ROI). This is because ClickFunnels works by bringing a client is and then offers them a series of steps that guide them through the sale. The funnels offer customers different options at different times which can increase sales from the clients. Although there are many software sales platforms that exist, ClickFunnels has been able to surpass them all. It offers a combination of features that will turn business marketing into a unique experience. Russell Brunson founded this company after being an online marketer who had trouble with creating his own sales funnels. He was able to build a solution that provided an easy way to market, sell and deliver products online. ClickFunnels makes it possible to build pages that funnel traffic through different phases. Allowing entrepreneurs to watch how their pages are converting and how they are interacting with the funnel. For many business owners, this is the best way to find success. Well, How Much Is ClickFunnels? Before buying or paying for a subscription service for any business, there are many factors to consider. But, there are products like ClickFunnels that are a no-brainers. They can make or break an entrepreneur’s chance of growing their business.This is a fact. The business angle does not matter. Whether it is blogging, affiliate marketing, SEO or Media Buys, ClickFunnels will bring about success when used in the right way. It’s a marketing strategy that can expand even the smallest of brands through enormous sales. 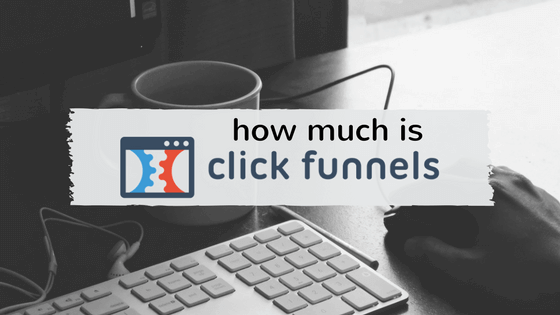 So, how much is clickfunnels? Under this option, business owners will be able to enjoy a total of 20 Funnels for a total of 100 pages. This affordable option guarantees business owners the best of software products and features. This pricing option has the ability of up to three custom domains. up-sell pages and down-sale pages. This pricing option also allows for sharing of funnels. Features like auto webinar funnels, webinar funnels, and hang out funnels are also included in this option. Unfortunately, this option does not have access to the two great ClickFunnels features. Actionetics and Backup. Entrepreneurs who select this pricing plan can enjoy a 14 day free trial period . The trial period offers the necessary training they need after signing up to ClickFunnels. Like its unique name, this ultimate pricing plan that allows entrepreneurs to make the most of the features that do not come with the $97/month plan. Not only does it include a diverse number of features, it also comprises of the two amazing and reliable ClickFunnels features. Actionetics and Backpack. • Actionetics: This is a replacement for an email service provider. It makes it possible for the entrepreneur to see everyone who has opted into their lists through the ClickFunnels contact pages. Actionetics allow for the sending of email broadcasts and creating auto responders. • Backpack: This is a complete affiliate program for ClickFunnels. That allows users to promotes affiliate links, banner ads, and email swipe copy. The Etison pricing plan also offers access to unlimited pages, unlimited visitors, unlimited contacts and unlimited custom domains. Both plans have a visual email builder feature. It also boasts options that allow for the management of email lists, autoresponder series and unlimited affiliates. Entrepreneurs can make the most of broadcast emails, easy set-ups, and one-time payments. With this pricing plan, managing affiliates is also an easy task. • Sales page funnels: Create upsells, sell products and services, one-time offers while maximize customer profitability. • Online courses: Entrepreneurs can use this feature to sell and host their online course within ClickFunnels. • Membership sites: Generates a recurring income for by creating membership sites within ClickFunnels. This option offers a 14-day trial period and a 30-day money back guarantees. ClickFunnels provides quality technical support that entrepreneurs will receive. Priority support in available to those who choose the Etison. All subscribers can be certain they will receive the best support at all times, regardless of their pricing plan. ClickFunnels is an amazing product for building sales funnels. It offers a reliable way to increase profit. When used well, it generates more profits than it costs. The education that results from using ClickFunnels is capable of changing the mindset of an entrepreneur. It is inevitable not to absorb the principles that it operates under. The 14-Day trial period is a good place to start. It’s an opportunity to learn about ClickFunnels and what both its pricing plans have to offer.